As Meeplecon is almost upon us (2 weeks and 2 days!) I thought I'd put a GeekList together to get an idea of what people want to play or are bringing. I've started the list with a few of the games that NSEG and I will be bringing, but please feel free to add games that you want to play or will be bringing. If you don't have the game, but would really love for someone to bring it so you can play it, make sure you indicate this. Also check out Unhalfbricking's Bought at Essen list 2013 for a listing of the games that Julian (unhalfbricking) will be selling... though be aware that priority is given to those who bought a voucher before Essen. He'll also be bringing demo copies of some of the games in his listing. It may not be as hot at the moment as it's brother, Glass Road is a quicker game (20 minutes per player) that will really make you think. AP isn't really an issue though as most of your decisions are made at the same time as the other players (when you all select 5 of the 15 cards). Uwe has taken the wheels from Ora & Labora and the buildings from Agricola: All Creatures great and small and mixed them together with some action selection card play that works incredibly well together. It's quick to learn but hard to master. 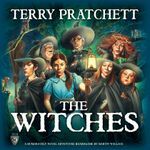 A light semi co-op from Martin Wallace, where you play as apprentice witches who must to deal with mundane problems such as Death, Pregnancy, Sick Sheep and hard problems (like Elves , Vampires). You either lose together or one person wins. It's Power Grid. It's Australia (and India). It's upside down. There's a carbon tax that comes into the game. We'll have at least 2 of these.... why wouldn't you want to play this? A game with artwork so lovely that I stood in a line to get the artist to draw a pig in the box lid. It helps that the theme is so odd and the game is quite good too. 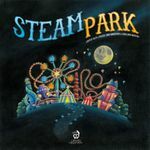 It's a game where you build a theme park for robots who work far too hard. You want to make a lot of money, but avoid making too much of a mess (as the government comes down hard on polluters). This is a fun gateway game good for the entire family (including the gamer). Sure it looks like Le Harve, but it's not. 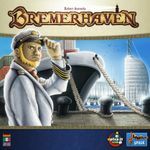 Bremerhaven sees you manage a port. Get ships to your port and offload their goods onto waiting transport. Each round you use your influence to secretly bid on actions. Interesting combo of worker placement and bidding. If there's enough interest, we'll have a Ticket To Ride tournament. 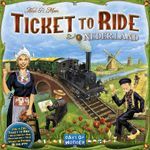 Like many of the other maps for TTR, Netherlands has a new mechanic. You start with a set number of coins. For each double route, if you lay track on the first route you pay a toll (in coins) to the bank, if you're the second to play on the double route you pay the first person the same amount of coins who played on that route. The person that has the most coins at the end of the game gets a bonus, the second a smaller bonus and so on. Changes the traditional game up a bit and well worth a play. The expansion for the ever popular Suburbia. New tiles, mid game bonuses and borders switch up the game. 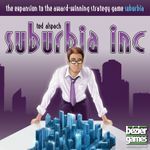 If you enjoyed Suburbia, you'll want to give Suburbia Inc a try. Last Will: Getting Sacked adds a bunch of new features to Last Will. In most games having a job is a great thing, but not here. You'll get income each turn and you'll have to get fired before you can be considered bankrupt. Should be easy, but your boss was a friend of your uncle so you'll need to really annoy him to get fired. You can also get married which can cost a fortune. There's also the ability to mix up the planning board, just to add a bit of variety. Based on a German graphic Novel (Steam Noir) this one is a game of bluffing. There are four factions fighting against the emperor. You secretly want one of those factions to come out on top, but not too far on top. The game is made up of 3 months, each four weeks long and each week is a separate battle. Via simultaneous selection you decide how much you'll support and which faction. You can even support the emperor. An interesting bluffing/negotiation game. We'll have at least two copies of this rather odd Friedemann Friese game. So we'll be able to play up to 10 players. From all accounts can be a fun convention game. What woud MeepleCon be without meeples? Fish, bananas and shells.... it's Carcassonne in the tropics. It's bright it's colourful and it's just different enough to standard Carcassonne to be refreshing without being to removed from the original. Huzzah! Who's up for some Super Dungeon Explore? 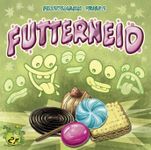 Candy Crave.... a new game from Friedemann Friese where you want to get the most popular candy. We'll have real lollies for you to play with (at a small cost) so that you can eat your winnings. The lollies will be wrapped and we can provide the ingredients/nutritional information for those with alergies.